We have recently been contacted by California Connections in Derbyshire, UK informing us that they have recently acquired a previously unknown to have survived YT from California. This car has been added Y&apos;s on Parade, so please welcome them with YT 4377 to Ys on Parade. Mike Long has also updated the photograph and text for YB 0279 in Ys on Parade too. Back at the end of May, Peter Sharp had spotted an MG Y in "Lipstick on your Collar". We have now been able to add a short video file for you to enjoy. Today please welcome Christopher Constantine with Y 1443 to Ys on Parade. Great news for MG Y Type Restorers! 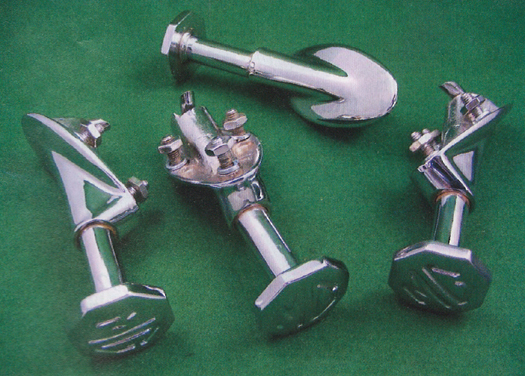 New from NTG is this set of four bonnet handles/catches for the MG Y, Y/T and YB. They are superb reproductions of this rare item which has been out of production since the 1950s. Often times the ones on the car you are restoring will be, at worst locked solid, at best cosmetically poor where years of neglect has taken its toll on the Mazak and chrome finish. These items are not pot metal reproduction but instead quality brass cast, chromes and polished. Although not cheap, these will provide the quality finishing touch and it is great to see them available again. Adding the DK book yesterday reminded me of another book I obtained a while back Schweizer Automobile that I still had not added to the Book Review page yet. That has now been remedied. Normally I would not expect any book on cars that subtitles itself "The definite Visual History of the Automobile" to even mention the MG Y, however, a new book buy Dorling Kindersley not only includes a reference to the MG Y Saloon, but also the MG Y/T!. See Book Review for more details. A report from Jerry Birkbeck on the 2011 Spring Run has been added to the Events Page. The mid-month Reprinted Article has been uploaded early for you to enjoy as I will be in hospital over the next few days and have uncertain internet access and I do not want you to be kept waiting. It is a reprint of an article from the Motor Trader of 1948. Additionally, here is another project I am working my way through for you that will hopefully be helpful to MG Y owners. I have not yet decided where to add a permanent link to this, but might do that in the next few days. Today, please welcome Michael Graf the new owner of Y/T 3214, Emil Meyer owner of Y/T 3378 (creating yet another matched pair with Y/T 3377), and Rudolf Burri owner of Y/T 3965 to Ys on Parade. The Picture of the Month comes from David Ward (Australia). The Reprinted Article comes from The Sacred Octagon magazine, April 1979 and is a 13 page article written by Richard Knudson entitled simply "The Y Series".